All audio professionals are welcome subject to available places. At last week’s first ever LSA session Britannia Row Productions’ General Manager, Nicola Amoruso, made an introduction to LSA followed by a mixing master class by Marcel Van Limbeek. Sherif El Barbari and Tony Szabo of L-Acoustics gave us a great overview on L-ISA and Immersive Audio on 10th October. Tony travelled from France that day and returned the next day specifically to give us the talk. Our thanks go out to L-Acoustics, Tony and Sherif for a most informative evening. So far we have used L-ISA immersive audio on the Classic Brits and Julia & Angus Stone, both shows at the Royal Albert Hall back in June and on some Childish Gambino dates in the U.S in September. On the 14th November, Tom Williams from DiGiCo hosted an exclusive look into the Area4 system for the new Live Sound Advanced series at Britannia Row. A presentation and practical demonstration of how to implement and use the Area4 was provided. Built on years of live audio experience, 4REA4 has been designed to meet the expanding performance requirements of large entertainment venues, houses of worship, theatres and shared stages at festivals and music venues. The session was arranged to cover the capability of the unit going into basic configuration set-up. Looking into different layouts, it was very helpful to look at the audio controls efficiency and the routing facility being very intuitive to use and program. Overall it was a useful snapshot of what DiGiCo is concentrating on to deliver in what is mainly installation business applied to live sound. In December Universal Audio and Yamaha told us about the new UA plug-ins for Yamaha consoles. During the day Tom Rundle from Yamaha provided training on the PM-10 consoles and Rio & DSP-R10 racks, covering advanced set up, configuration & networking including Yamaha’s new TWINLANe. This included the first dual redundant DSP-R10 setup in the UK. The session allowed our engineers to go in depth in with the system and explore the console to it’s absolute limits. For the evening’s LSA session Tom Waterman from Universal Audio joined forces with Tom Rundle from Yamaha to talk about the UAD live rack and how easily this interfaces with Yamaha consoles. UADs industry leading plugin quality, with extremely simple MADI integration, coupled with the compact, flexible and powerful QL system creates an incredibly compact system that can compete with much larger consoles and outboard racks. In January Figure 53 joined us to give a thorough understanding of their software, QLab. These sessions were taught by project manager and sound designer, Sam Kusnetz. Sam took the class through all of the functions in Qlab relating to audio. These included the basics of creating and editing a cue list, as well as the integration with timecode, lighting and video. The session also covered the subjects of how Qlab deals with licensing and redundancy. Towards the end of the class Sam began to look at the advanced ideas of scripting for Qlab which can enable a more flexible and efficient workflow. The session was informative and engaging, with lots of examples of how the principles built in to QLab can and have aided a performance. In the evening, Sam was joined by well respected sound designer and theatre sound pioneer; John Leonard. The pair discussed the art of sound technology over John’s career. Ranging from the use of multiple 78 rpm turn tables for sound effects playback to modern day Qlab. John also spoke about his time as a field recordist and how this helped him to fulfill even the most demanding brief. A thoroughly enjoyable evening and big thanks to both Sam and John for their time and valuable information they gave us. The focus for February's Live Sound Advanced evening session on Wednesday 13th February was on DPA microphones. 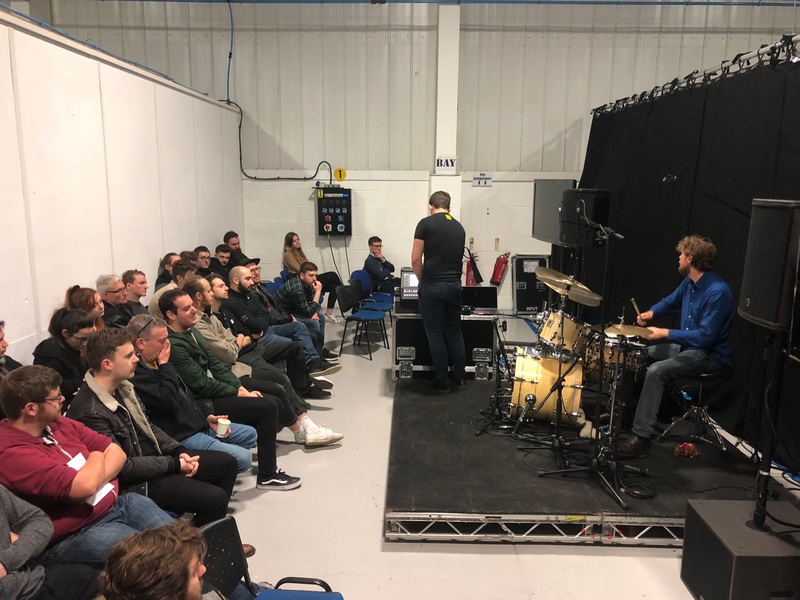 The well attended session was run by DPA's UK distributor, Sound Network, who demonstrated DPA microphone solutions for drums using a live drummer and demonstrating the use of different microphones in different positions and in different combinations through live multi track recording playback. Les Mommson of Sound Network presented the session and went through microphones theory and basic principles. using videos and slides and then on to how in the DPA manufacturing process every part of the microphone goes through specific treatments and tests before the final product is achieved. Les gave us the chance to take a close look at various microphones' components. The session then moved on to the practical part of the training. 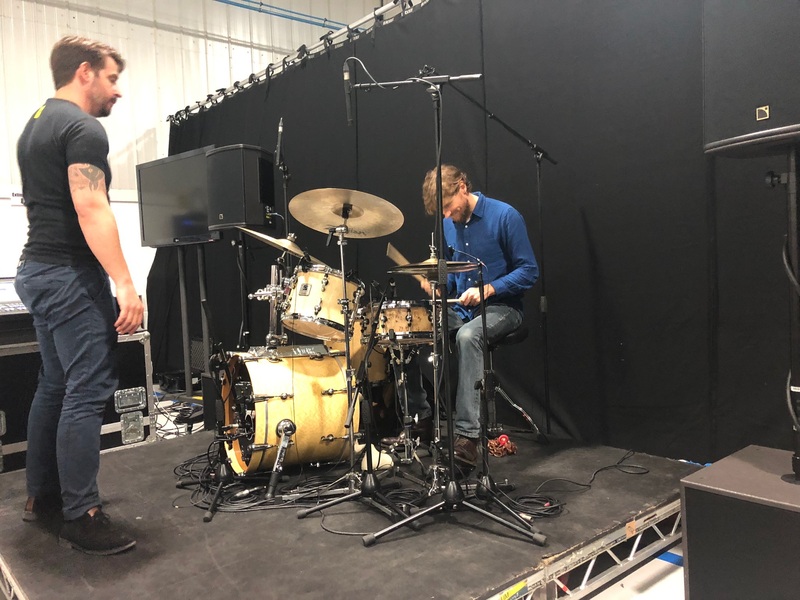 A drum kit and live drummer were in place for a practical demonstration of how to mic up a drum kit .During this demonstration we learnt that although the number of different microphones used was over ten, the type of capsule inside the mics was only two. We listened to the different mics used on the drum kit and chose the best sounding ones for the final rough mix. A thoroughly fascinating and informative day! Our thanks and appreciation to Les Mommsen and drummer John Scott for a very well presented/informative and interesting day. In March we hosted another fascinating LSA session. The daytime session was delivered by Shure, a company at the forefront of RF technology for audio. Jack Drury and Stuart Moots spent the day taking a number of our warehouse staff through the history and principles relating to the use of RF in live audio events. These included the fundamentals of how audio is transmitted and received over RF including digital transmission, the immediate implications of the selling off of the 700MHz range and some of the ways that an expanded knowledge of coordination software, such as Wireless Workbench, along with Shure’s newer digital technologies could help to overcome these issues. Jack and Stuart also covered how Axient Digital system can be configured to provide multiple layers of redundancy including: Frequency Diversity, Quadversity, Signal Redundancy via Dante, AES and Analogue, External DC backup PSU as well as the potential for mirrored receivers in future updates. The session was engaging and informative with many interesting points for discussion. In the evening session Gareth Johnson spoke about his experience as the sound designer for Formula E. Gareth discussed his aims, vision & workflow in creating the sonic identity of Formula E, as well as giving advice to attendees on various ways into becoming a sound designer. Our thanks and appreciation to Jack, Stuart and Gareth for a very informative and interesting day. For details email info@training.britanniarow.com for further information.